Posted November 27, 2017 by Suwannee River Rendezvous & filed under Camping. Is there someone in your life who loves to go camping? If so, there are plenty of great gifts to consider this holiday season. To help get you started, we put together a few of our favorite gifts for camping enthusiasts. Check them out below. Cooking on a campfire certainly has its charms, but it’s not always a practical option. That’s why a good camping stove is nearly essential for overnight backpacking trips. 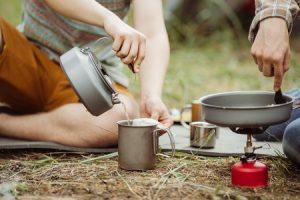 This compact stove from MSR, for example, is small enough to fit in a cargo pocket, but powerful enough to boil water in under 4 minutes. It’s not always easy to find a comfortable place to rest when you’re out in the wilderness, so a camping hammock is a great accessory to keep in your pack. Just anchor one of these lightweight, portable hammocks to two trees and you’ve got a comfortable place to take a nap and watch the world go by. It’s always a good idea to have one of these on hand when camping in remote areas. In the past, you may have had to purchase water purification tablets. Nowadays, however, you can find hand-operated pumps that filter water without chemicals. With one of these handy tools, you can always find potable water at the nearest stream. If you’re still struggling to find the right gift, why not treat your loved one to a camping trip on the beautiful Suwannee River? Book your reservation today, or give us a call to learn more! Posted November 10, 2017 by Suwannee River Rendezvous & filed under Camping. If you love the great outdoors, than you know how restorative spending time in nature can be. But did you know it can even help you overcome sleep problems? New research shows that camping can help reset our internal body clocks. Due to our frequent exposure to artificial light, many humans stray from a natural sleeping pattern. 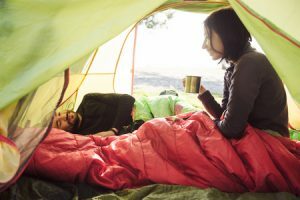 But one week of camping outdoors and getting away from artificial light sources is enough to return a person’s body clock to its natural sleep rhythms, according to a recent study published in Current Biology. These findings demonstrate that our internal biological clocks will quickly synchronize to a natural light-dark cycle if the opportunity arises. During their one week of camping, the study participants’ average light exposure increased by more than four times. This added exposure to natural light caused changes in their brains’ melatonin production, which made it easier to wake up from a restful sleep. Many of the participants who usually experienced sleep issues claimed this was the only time they were able to get uninterrupted sleep by going to bed early and waking up early. This suggests that carefully controlling our exposure to artificial light, particularly at night, could help successfully treat sleep problems. For a relaxing and rejuvenating camping experience to get your sleep schedule back on track, come visit us here at Suwannee River Rendezvous in Mayo, Florida! We offer a variety of primitive, water/electric and full hook-up sites. Contact us today for more information! Posted October 5, 2017 by Suwannee River Rendezvous & filed under Water Activities. You’ve got your reel and your bait, and you’re excited and ready to head out for your fishing trip. But wait! A little extra preparation can go a long way toward helping you have a good time on your adventure. Make sure you keep a few extra tools in your tackle box so you can be ready for whatever the river brings your way! Sometimes you need a little help to get your bait and tackle ready to go. Sometimes it’s tough getting a hook from your fish’s lips – especially if it has long teeth. Sometimes, your cast might not go as planned, leaving you with a hook caught in your jeans. A good pair of needlenose pliers can help you in all these situations and more. This one may go without saying. A good rust-resistant knife can help you clean fish, cut lines, slice bait, and accomplish any number of other common tasks you might face during a fishing trip. These items are guaranteed to come in handy, but they can be easy to forget. Don’t let your day be ruined by mosquitos, sunburn and headaches. You can stop these issues in their tracks, even if you’re miles away from your medicine cabinet. Most anglers don’t intend to ignore length and weight restrictions when they go fishing, but let’s face it: sometimes even our best estimates can be a little inaccurate. Pack a good lip grip with a scale to measure your catch’s weight, and a cheap old ruler to check its length. You can even take photos with your ruler for friends who may doubt your fish tales later! This is a great item to have around on evening fishing trips, especially when you wait just a little too long to call it quits for the night. A little extra light can go a long way. No one plans on getting hurt, but cuts, bumps and bruises are a fact of life. It’s always better to be safe, rather than sorry! While you’re at it, go ahead and prevent those cuts and scrapes with a good, strong pair of gloves. It’s nice to have a first aid kit, but it’s better if you don’t need it in the first place. 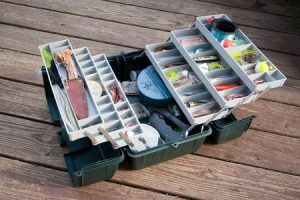 Ready to put your tackle box to good use? Give us a call today to schedule your next fishing trip on the beautiful Suwannee River! Posted July 27, 2017 by Suwannee River Rendezvous & filed under Water Activities. Kayaking is an ideal way to get in touch with one of the most elemental forms of water travel, and depending on where you choose to kayak, the experience can range from peaceful to thrilling. If you’ve never been kayaking before, though, you may have some lingering questions about what to expect on your first trip down the river. Like any water sport, kayaking takes some time to get the hang of, but with a little practice and preparation you’ll be ready to get out on the water. Do your best to sit upright with your back straight, as leaning forward or slouching will give you less control over your movements. Your heel and ankles should be touching the hull and the balls of your feet should rest comfortably against the footrest. These contact points allow your body to distribute the strength needed to maneuver your paddle in the most effective manner. Contrary to popular belief, paddle strokes rely mostly on your core rather than arm strength. Your paddle blade should enter the water near where your feet are in the kayak. Don’t grip the paddle too tightly, keep it relaxed. Your elbows, meanwhile, should stick out straight so that your arms are roughly perpendicular to your torso. It’s a good idea to practice maneuvering your kayak before committing yourself to an excursion down a river. Controlling the direction of your kayak takes a little bit of getting used to before it becomes second nature. The kayak will be inclined to shift in the direction of the paddle blade, so you’ll need to make firm, even strokes on each side to move in a straight path. The opposite holds true if you want to make a turn, and the sharper the angle of your paddle stroke, the sharper the angle your kayak will turn. Practice paddling straight, turning right and turning left until you feel totally in control of where your kayak’s headed. If you’re going to be kayaking in rough waters, it might not be a bad idea to invest in a wet suit. This way, you’ll stay dry even if you get splashed or end up in the water. With that said, sporting a personal flotation device is absolutely essential, regardless of the conditions you’re kayaking in. It’s also advised that you bring some sort of communication device like a walkie-talkie in case the current leads you astray and you need help reconnecting with your party. Whether you’re a beginner or a seasoned veteran, safety is integral to having a good time. Now that you know what to expect, we’d love to have you come down to the Suwannee River and join us on a kayak trip! Give us a call to book your reservation today. Posted June 1, 2017 by Suwannee River Rendezvous & filed under Camping. Summer presents ideal opportunities to peel your kids from their screens and shuttle them off to participate in a timeless past time: a retreat in the forest, a camping trip. This is a great opportunity to share our enthusiasm for the great outdoors with our children, and allow them to experience the joy of camping. As you might suspect, however, camping with children is a little different than camping with a group of your adult friends. That’s why we put together some tips to ensure the process is fun for everyone involved. Leave the electronic devices at home. Nothing will detract from the experience of camping more than having digital devices laying around for entertainment. Both you and your children will be tempted to pick them up and fidget with whatever game or app you have at hand, distracting you from other experiences that can only be had while camping. Involve your kids in the planning process. Let them help plan the itinerary, find the campsite and pack for the trip. Kids love brainstorming with adults and, letting them have a say in the plan is a good way to get them excited about camping. 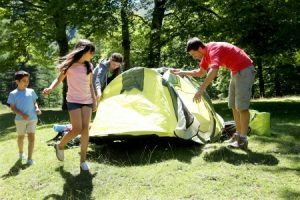 Assign tasks for your kids during the camping trip. Children love to play but, they delight in being assigned a purpose. Let the kids unfold the tent, clip the body onto the poles, send them on an urgent mission to collect firewood and have them perform other duties as assigned. Make sure you have a well-stocked first aid kid. Minor accidents such as cuts, scrapes and bee stings are more likely to occur in the wild than in your own backyard. Likewise, it’s important keep first aid essentials readily accessible throughout the duration of the outing. As much as we might hope for crisp clear skies and sunlight pouring through tree tops, rainy weather is a fact of life. With this in mind, it’s worth bringing a deck of cards or other games you can play in a tent on a rainy day. You can also find more games, puzzles and family-friendly activities in our main lodge. These activities include karaoke, bingo, trivia and even pigeon races! Stock your camp with pre-made snacks. You and your children will inevitably burn a lot of energy while partaking in outdoor activities. Don’t forget to bring plenty of snacks to keep your stomachs full. After all, the nearest grocery store might be miles away from your campsite. The most effective way to enjoy a camping trip with your children is to keep an open mind. Be open to changes in your plan, and circumstances that you didn’t necessarily anticipate. Remember: camping is an adventure! Camping is an ideal way to expand your child’s perspective of the world and reignite their natural kinship with nature. Plan ahead, but be flexible throughout your journey. These are memories you and your family will cherish for years to come. Posted May 1, 2017 by Suwannee River Rendezvous & filed under Miscellaneous, Suwannee River Activities. When you think of presents to give dad for Father’s Day, what comes to mind? A tie? A coffee mug? Nice gestures for sure, but probably not something dad will forever cherish. People today value experiences more than things, especially when you’re spending time with those closest to you. Okay, so Father’s Day is coming up. What are you getting dad? 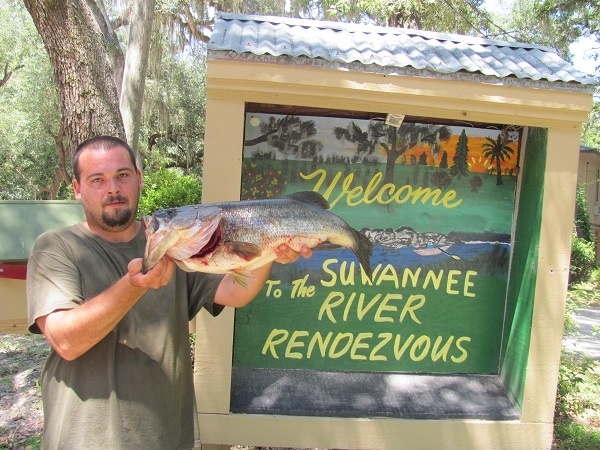 How about this year you arrange for a hunting/fishing trip at Suwannee River Rendezvous Resort & Campground? How’d you like a picture of your dad smiling as he reels in a 12-pound bass off the bank of the resort? Or maybe a picture of him capturing a wild hog in the Mallory Swamp WLR? Located in Mayo, Florida, Suwannee River Rendezvous is a great place for dads to “escape” their everyday lives. Too many dads today “work, work, work” and are always worrying about paying bills. Dads need a break from that now and then; it’s good for their sanity! What better way for a dad to unwind his mind and have some fun than to fish off the dock at Suwannee, take a boat ride, or explore the swamp looking for hogs? It’s time to get dad back to nature where he can grunt, sweat, fart and feel free! Meanwhile, back at the resort/campground, dad can check out the cool Convict Spring, a natural, freshwater spring that actually feeds into the Suwannee River. If the weather’s decent, dad can go for a swim in the spring. But wait…there’s more: dad can dive down into the spring to find an underwater cave system entrance. That’s something he’d be talking about for years to come, right? Men crave adventure. They have an inner need to explore. And many men want to fish and hunt– being “out on the land” or “out on the water” is their time to enjoy being male. It’s in the DNA. 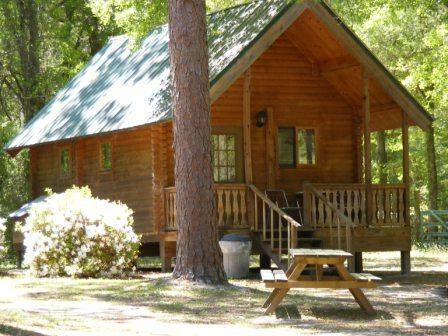 So this Father’s day, surprise your old man with a hunting/fishing trip at Suwannee River Rendezvous Resort & Campground. Call 386-294-2510 to make arrangements today. Posted March 7, 2017 by Suwannee River Rendezvous & filed under Miscellaneous, Suwannee River Activities. When visiting us at Suwannee River Rendezvous, guests get to see the beautiful Suwannee River and take in the beautiful water and scenic sights of northern Florida. However, have you ever wondered where it all comes from? Well, the answer lies in the Suwannee Springs. For those who may not know, the Suwannee network of springs covers a vast span throughout the region and feeds into the river network, providing the waters that sustain the river as it flows from the headwaters in Georgia all the way to the Gulf of Mexico. One of the most prominent places to see these springs is the Suwannee Springs State Park, managed by the Suwannee River Water Management District. Located about 40 minutes from Suwannee River Rendezvous, the site features six different springs for people to take in and enjoy. Once you arrive, you will notice all of the springs flow outward in a southwest direction, which funnels them into the Suwannee River itself. You will also notice that all six are clustered within the same 100-foot span of sandy terrain at the base of a 35-foot high bank stretching right along the south shore of the Suwannee River. The main spring is something to behold as well with its unique location. You can’t miss the sight of this spring, notably located within rock walls constructed as part of a bathhouse from the late 19th century. 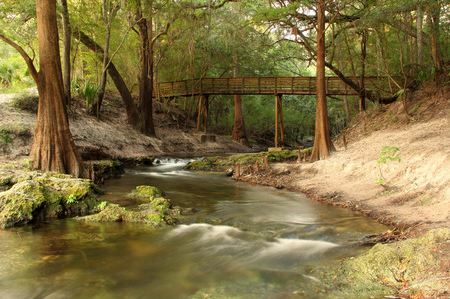 The Suwannee Springs are more than just a historic site. Visitors can also enjoy swimming, snorkeling, kayaking and canoeing, hiking, a picnic area and trails for horse riding. All of these activities offer the perfect opportunity to get out and explore the area. Along with those great activities, the Suwannee Springs also are home to a wide variety of wildlife as well. Some of the animals you may see while there include gopher tortoise, gopher frog, Suwannee cooter, deer, turkeys and squirrels. The river itself is also lined with rich history tracing back through generations of settlers in the region. As the state park’s brochure notes, Native American tribes in the region relied on the river for fresh water and access to game as far back as 12,000 years ago. In the 1500s, Spanish explorer Hernando de Soto passed through the region, and in the 1800s, the region became populated by American settlers. There are also remnants of the Civil War that can be seen in places, including earthworks and other constructions that formerly were part of bridges and defense positions manned by Confederate troops. If you want to explore the Suwannee River area and it’s great history, make your reservations at Suwannee River Rendezvous today. We have one of the springs that feed the river right here on site – Convict Spring – and several more within a short drive from the resort. We have plenty of space for RV and tent camping as well as a range of cabins and lodges for guests. For more information or to book your stay, call us at 386-294-2510! Plan Your Reunion Rendezvous at Our Camping and RV Resort! Posted February 13, 2017 by Suwannee River Rendezvous & filed under Suwannee RV Resort. While it may still be winter, that doesn’t mean it’s too early to start planning your outdoor fun for the summer. Before you know it, spring and summer will be upon us – the perfect time to hold your family or class reunion. 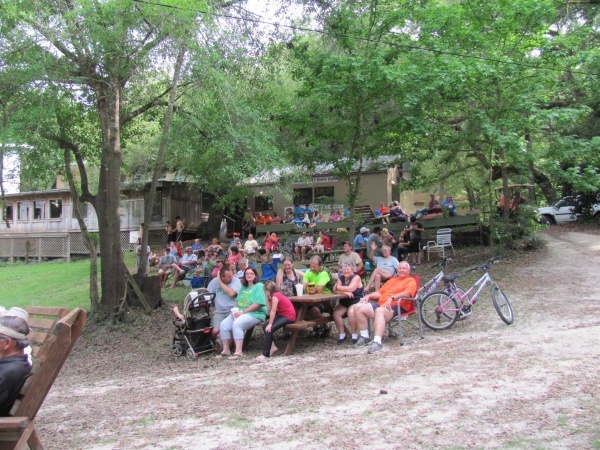 Suwannee River Rendezvous can accommodate activities and has plenty of lodging options, camping space and RV sites that makes it the perfect destination to hold your event. Let’s take a look at how you can plan large get-togethers on our campgrounds. Reunion weekends are always chock full of bonding activities, and we offer an array of outdoorsy events such as canoeing, fishing and hunting for everyone – young and old – to enjoy. For those who prefer to take it a little slower, we also offer bingo, live music and drawing activities, giving you options for all ages – and all weather conditions. 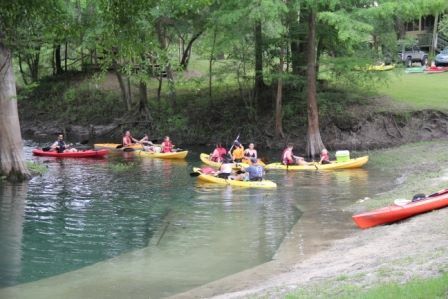 Suwannee River Rendezvous has something for everyone, and with plenty of space, you won’t be crammed together for space while enjoying time catching up with old classmates or bonding with rarely seen relatives. Suwannee River Rendezvous is also home to Convict Spring, where many of our guests enjoy cooling off. This freshwater spring is home to turtles, fish and other fascinating marine life, and is a great place for children to swim and play while you catch up with other attendees on the shore. We also have many areas that you and your guests can take advantage of during your event. Our picnic pavilion can provide a convenient gathering place for everyone to enjoy a big meal together, while the playground and heated pool can serve as a wonderful place for children to play. If you are interested in organizing a reunion or large camping trip, Suwannee River Rendezvous has everything you can imagine. Bond with your friends and family at our beautiful grounds and enjoy a great vacation and reunion all at once. If you’re planning a reunion, let us know and we can work with you to try to group all guests together to create a community atmosphere during your stay. To learn more, call us today at 386-294-2510. Posted January 10, 2017 by Suwannee River Rendezvous & filed under Water Activities. Outside of the knowing that they’re used for recreational boating on the water, many people don’t know the differences between a kayak and a canoe. The truth is that each offers purpose-built advantages depending on a person’s needs and boating style, so let’s take a closer look at each of these boat styles. When it comes to what sets kayaks apart from canoes, the simplest place to start is with how they are designed. Canoes are open on the top from stem to stern, and can have one to three seats in them. This allows more space for gear and supplies and allows paddlers and passengers to either sit or kneel while they’re out on the water. Kayaks, on the other hand, are enclosed and have a small opening in the middle where the rider slides in. Kayaks are paddled from a seated position with their feet facing forward while they paddle. Speaking of paddles, those used for a kayak are different than the ones used for a canoe. For a kayak, seeing that it only holds one rider, the paddle is double sided. This allows a person to paddle with alternating port and starboard strokes stay straight on course and maintain control of the kayak. As for canoes, the paddles used for them are a singular paddle, but multiple paddles are used – one by the person at the bow and the second by the paddler at stern. So whereas the kayak depends on one rider to steer, paddling a canoe is a team effort. Now in terms of which one is best suited for you, it ultimately depends on what you are trying to do while on the water. If you’re looking to fly through the water at a good pace and explore your surroundings by yourself, then a kayak is likely to be a better option for you. Their design allows them to move faster in the water and that will be perfect if you’re looking to move at your own pace. Canoes, on the other hand, are perfectly suited for couples, families or groups as they fit more people. Unlike kayaks, their designs don’t allow them to move through the water as fast, but if you’re looking to spend time with people or carry a lot of gear, you probably don’t want to rush it either. 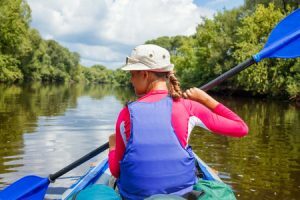 Suwannee River Rendezvous offers canoe and kayak rentals for anyone staying with us, so no matter how you’re looking to travel on the water, we’ve got you covered. Rentals are available by the hour or per day, allowing you to choose the option that’s best for your planned time paddling. Guests also receive life jackets and paddles, and group rates and special trip packages are available. For more information or to book a stay with us, call us today at 386-294-2510! Posted December 21, 2016 by Suwannee River Rendezvous & filed under Camping. Now that winter is pretty much here across most of the country, that means cold temperatures, ice and snow are here to stay for a while as well. If you aren’t a fan of any of those and are looking for a temporary escape, the Suwannee River Rendezvous has plenty of space available. Our rooms are perfect for anyone looking to get away to enjoy some warmth and wilderness but without having to give up the comforts lost when RVing or tent camping. Our rooms offer a full range of amenities including satellite TV, fridge, microwave, coffee pot and air conditioning if you need to cool down from the warm Florida weather. The Lodge Rooms are located above the main lodge and office and offer a great view of the river. They also include a private patio, so at the end of a long day out enjoying everything the Suwannee River as to offer, you can go back and enjoy some peace and quiet. This privacy is a perfect for anyone who may live in a cold city and needs some separation from the cold and the hustle bustle of a busy city. If you’re bringing your family along for your wintery escape, then one of our log cabin rentals might be just what you’re looking for. Each cabin sleeps six and has all the amenities to help make an extended stay for a larger family more comfortable, including a lofted sleeping space that kids are sure to love. For anglers, winter can mean the end of fishing season, but if you stay in one of our river rooms, you will have easy access to the river – and may be able to fish right from your room! Depending on the level of the river, guests have fished right from their private patios before. These rooms offer a great view as well, even if you don’t like to fish, and can accommodate up to six guests. For more information on our rooms or to book your wintry escape, call Suwannee River Rendezvous today at 386-294-2510!